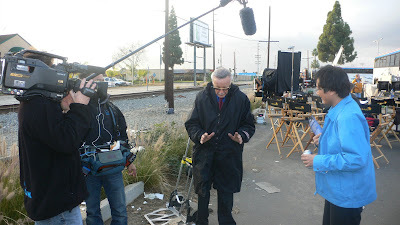 OK – last night’s episode was one that I directed, which invariably means that I have more to say about it. First of all, this is the one split episode that every TV show does each season. This means that we prepped the episode in late December, then took a two-week vacation, and then came back shooting. Historically, on whatever show I’m on, this episode is one that I, as the show’s producer, frequently take on, because it’s hard on any other director. In late December the crew is tired, everyone is really ready for their Christmas break, and the prep is frequently kind of sketchy. Jim Chory, the line producer and I, joked about how there are several days back in December that we don’t even remember. Then, to make matters worse everyone goes and rests and forgets all about the show, and then, with no days of additional prep – we all just come back and start shooting. I took this episode on because I’m pretty good at rolling with the punches and thinking on my feet. And, because I know the show so well, I can compensate for anything that slips between the cracks. HEROES is a real tricky show as a director, because there are so many different stories going at once, and because each story has it’s own unique visual style, pace and performance style. It’s hard enough to grasp the different styles, if you don’t also plan how the styles will integrate together you can end up with an episode that feels vaguely erratic. I don’t knit, but I imagine it’s like knitting a sweater with a number of different types of wools and thread pattern. You have to carefully plan what you’re going to do ahead of time and then make sure you’re executing it in the moment. Maybe the thing to do is to just talk through a few scenes and talk about what I was going for stylistically and in terms of performance. First of all, I’m very happy with the whole Peter/Claude/Isaac storyline. My whole directorial style is to try to first glean (a) which character controls the scene – sometimes it shifts within a scene (b) what is the inherent emotional quality of the scene – meaning, both, what do the characters feel and what do I want the audience to feel? – sometimes they’re the same, sometimes they’re different. (c) what stylistic techniques – i.e. what colors, compositions, camera movement and camera lensing – will support these emotions. I wanted the Peter/Claude – Peter/Isaac storyline to have a uniform quality, an inherent tension. I’d been noticing that handheld really works for us. I’d done a lot on my episode 6, less so on episode 9. I consciously chose to do most of this storyline handheld. In the first scene with HRG and Isaac, HRG is in control of the scene. So in that one I used cranes and dollys and let the shots sweep and push in. Trying to visually mimic the emotion of the scene – pressure. The pressure HRG is putting on Isaac. After that, there’s a scene on the roof with Claude and Milo, where Claude beats the hell out of Peter with a Bo Stick. In this almost every shot is handheld and the camera trades off from character to character a lot. This technique adds a sense of chaos and unbalance - and whenever I cut wide to show the special relationship’s (important to do so your audience doesn’t get completely disoriented) I used big sweeping wide shots done from a crane, which are always passing over foreground objects. Moving past close foreground on full figure shots adds both a sense of speed and a sense of pressure. In the second rooftop scene, the one at night (which begins with Claude and Peter and then shifts to their being attacked by HRG and The Haitian), I began the scenes on the dolly, with lyrical dolly shots. The first shot is a longish dolly shot which begins on a pigeon, drifts across the birdcage into a two shot of Peter and Claude and then pushes in. There was no coverage (i.e. other shots to cut to) until Claude turns and says, “I think he meant you friend." Eccleston came to me before the scene and expressed that he thought it was important on that one line to express a softening in his character. That he’s beginning to like and be impressed with Peter. I agreed and supported this with gently moving shots. When HRG appears all the angles on Claude and Peter go to handheld – but the ones on HRG and Haitian are stable – on the dolly. I particularly love the wide wide shot where Peter jumps off the edge of the building. Our set is a huge set on a blue screen stage. I shot it as wide as I could and the VFX people at Stargate added a background building extension and New York backdrop. It’s so cool. It’s a quick cut, but it looks like Peter just jumps off the building and drops into nowhere. The flying shots I had actually shot way back in December, at the same time as we had done shots for Peter being thrown off the roof for episode 14. 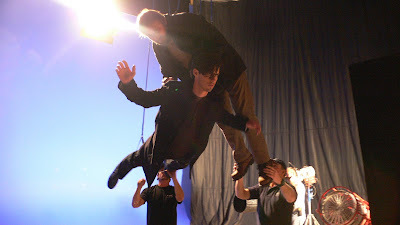 I’ve done flying before, on SMALLVILLE. There’s a sequence in the season premiere of season 4, when Clark flies into the air, out onto the edge of space and up to Lex Luthor’s jet. I thought that was pretty good TV! But trust me flying is hard too do right. 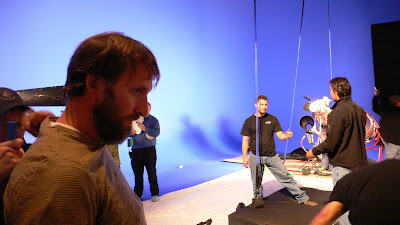 You have to hang the actors in uncomfortable positions on a huge blue screen stage and blow giant wind-fans at them, then you have to swoop the camera around them to mimic their flight through the air. The hours fly by as you have lots of discussions about “tilt” and “yaw” while the actors are getting angrier and angrier because their testicles are being crushed by the harness they’re in. It’s not that fun. I’m pretty happy with the way Peter’s flight turned out – but I don’t think it’s 100% brilliant or groundbreaking. I tell you this is a really hard thing to do right. Next time I’ll do better. I’m very happy with the scene in Peter’s apartment where Claude wakes up, gets all paranoid and runs out. This scene, to me, was driven by Claude. Claude is scared – a state we’ve never seen him in. He knows he’s in danger. Peter is confused. I wanted to support this emotion, again by going handheld and also by dropping back and shooting with long lenses through windows and French doors – long lenses compress the filmed image and this created tension and a sense of “surveillance” – like they might be being watched. I alternated this by doing super close close-ups on relatively wide 40mm lenses. Alternating between long lens full shots and wide lens close ups is sort of the opposite way from the traditional. It gives the scene an unbalanced “afraid” feeling. I’m pretty happy with the Suresh/Sylar story as well. First of all I think these two actors are terrific together. Zack Quinto was amazing at shifting between the mild mannered character of Zane and the frightful Sylar. 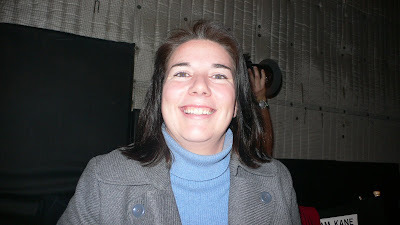 The gust star Rusty Schwimmer was great and brought great empathy to her character in just 2 short scenes. I got a little experimental in these scenes and with, in my opinion, some but not complete success. Again I went hand held for a lot of the firsts scene when the two guys arrive at the car repair shop. The first phase of that scene, for me, was about general movement – Mohinder controls the scene – but he’s not completely “in” control of the result. In this part I made the camera move handheld on a relatively long shot that tracks them in, playing a fair bit of dialogue on their backs. Being on backs when people are talking creates a sense of discomfort in the audience. You have to be careful with it, because it can also alienate the audience from the characters – so you have to do it at the right time. As the scene progresses Sylar begins to take over. Here I began to use a “swing and tilt” lens on many of the close-ups. The swing and tilt is a lens that was invented for architectural photography – to photograph buildings and keep the whole surface of a building in focus. With most lenses the plane of focus is flat. With these lenses the plane of focus can be shifted to the diagonal, either up and down or side to side. So, as Rusty’s character began to tell her story, and Sylar gets excited about obtaining her power – I used these lenses in his close up and her close up – but not on Suresh’s CU. To the audience the close ups look “weird” kind of in focus, kind of not – but now what we’re normally used to seeing. Again – it’s uncomfortable. I’ve been using these lenses a lot on HEROES, but not so aggressively in a place where you would normally use a traditional lens – like this scene. At the end of the day I feel it’s only a partial success. The shots are a bit too self-conscious. And, because we’re in traditional coverage, we cut back to them several times, which makes them call attention to themselves more than I’d like. Next time I’ll back off this technique or use it AND get a regular shot – so the weird ones can be used more judiciously. Later, however, I used the same technique to good effect. In the scene where Sylar comes to kill Dale, I used one swing and tilt lenses on one shot on her close up when she says, “What’s that sound in your heart.” And again in the close up where he says “murder.” Once more, the shots feel weird and the plane of focus is not what we’re used to. But because each shot is used just once or twice the technique doesn’t become so apparent – and it works better. All the scenes in the Bennett storyline I’m quite happy with as well. Claire’s scenes tend to be driven by Claire. She is always fighting for understanding and stability. I tend to be more stable with the camera in Claire’s story. Not moving the camera or moving it slowly and menacingly. In the scene where she nervously tells her mother not to trust Dad, for instance, the camera was always static… But I alternated between big wide shots where Claire and her mother were on opposite sides of the frame and the couch and coffee table dominated the foreground. I shot Mrs. Bennett’s close ups traditionally and shot Claire’s shots either super-tight, or off-center with uncomfortably little room on the leading edge of the frame – all designed to create a sense of discomfort. Because the camera’s never moving, the pace of editing determines the rhythm of the scene. In the mother’s speeches we tended to stay in one shot. In Claire’s speeches we tended to jump from one Claire close-up to another. Again this adds a sense of disquiet and tension. The scene in the hospital with Claire and her father is one of my favorite scenes I’ve done on the show. I did nothing fancy besides shoot two close ups… But Jack and Hayden were awesome. On a performance level I talked d to Jack about the idea of losing control. That this is the first time in the show we’ve seen a chink in the armor. . I think he played that wonderfully. I particularly love his expression when he thinks that, once again, he’s been able to win her over and she suddenly shouts “No!” and pushes him back. Sometimes in my job it’s about style. Sometimes the most appropriate style is to get out of the way and let the actors and the script do their thing. Actually, the last Hiro and Ando scene I really like. The one where Hiro says goodbye and gets on the bus. I think Masi and James did a very nice job and the scene feels melancholy in a good way. Also, when Hiro gets on the bus, the bus driver is played by Stan Lee… Stan Lee! The guy who invented Spiderman, The Fantastic Four and the X-Men!!! How cool is that. He’s like the funniest nicest guy too. That’s it for now. Next week we blow up West Texas and see how it all began for Claire and HRG! Hi there, and thanks for this great blog! I just want to say that the scene with Milo and Chris fighting with the Bo Stick was gobsmacking brilliant! These two have great 'duo' chemistry, and I really hope Chris will be on the show for a while! Great comments about the filming (this does not go unnoticed). The scenes at the top of the blue screened Deveaux building and the CGI are truly magnificent. One more thing...I had to console a male co-worker today because he was all worked up about Sylar's evilness. Hehe. Great job to all! I agree with you on every point in regards to your directing of this episode, Greg. There were places where you went wrong, made some bad choices, and it was painfully obvious. Those weirdly distorted and out of focus scenes at the car repair shop were just...well, I kept thinking, "Why didn't they reshoot this? It's horrible and never should have made it to air." But just as you noted in your blog post, there were other things you executed beautifully and with masterful precision in this ep. That scene in the hospital between Claire and her dad, for instance. Fan-friken-tastic. The flying scenes with Milo (my future boy toy) and Chris (the Best. Doctor. Evar. )...great job on those two. One thing I'd like to mention about the acting in this ep, in particular, the hospital scene with Jack and Hayden. Comparisons have been made between the characters of HRG and Cancer Man/CSM from the X-Files. I really appreciated Bill Davis's work in that role (note to self: hire him for The Black Tower) and I remember, I guess it was in season 4 or 5, where the icy-cool CSM had his very first public freakout (with Mulder, I think it was). Bill played the scene with an edge of fear and panic in his voice. Very unsettling to see a character who always plays it so cool, so close to the vest, have a meldown, even if just for a moment. I saw that same kind of reaction in HRG in this ep. Jack did a fantastic job. Please tell him I said so, Greg. Thanks again for involving us in the Heroes process. There is, however, one thing that bothered me in this episode. When Chris and Milo were flying, Chris is slumped over Milo like an unconscious sack of potatoes. We don't really get to see him react, or maybe I just missed this. Great job with the Sylar shots though. I totally imagined him drooling as Dale explained her power. The directing in this show is really stellar, and it shows through. Most people take cinematography and camera work for granted, but reading your blog each week has definitely made me start noticing how each director does his or her own thing. I particularly thought the scenes with Sylar and Mohinder had a really cool feel to them, and the close up on Sylar when he said 'murder' was downright chilling. First thing I've got to tell you is that I (and all fans) really appreciate the time you take to write your entry for every episode and describe the shooting process, your emotions, and episode aspects that are completely unknown for most of the viewers. It really makes me feel that I'm more connected to the show than just watching its episodes, and it significantly does improve the viewing experience. Regarding the series, I've got to congratulate you and the whole team for coming up with such masterpiece. Even though it sometimes reminds me of X-MEN, every new episode I keep finding why HEROES is in fact way different. The way you speak openly and honestly of your work is admirable, expressing pride and self-criticism within the same paragraphs. There are of course many other things present. Open-mindedness. Concern. It is probably too obvious fruitless to list them all. I don't mean to sound rhetorical and dramatic. It's something that I enjoy having the opportunity to appreciate - the conscious engine behind a creation. Too often that consciousness is faceless and anonymous. If the goal in creating a work, such as a TV series, or a record, or a book is to communicate with your peers, the blog adds a very nice and personal touch. You demonstrate the desire to excel in your craft well enough simply by viewing the episodes. To read your afterthoughts, to me, really just seals the deal. Thank you for sharing this here. Fantastic episode! Last week's, though interesting, was a bit of a lull progress-wise. "Unexpected" was return back to form. This week's blog post was also a fascinating read, thanks a lot! and i know how you all love to praise the acting skills of hayden and zach, but i would like to give kudos to both jack coleman and milo. The best episode so far , well done Mr Beeman!!! Thanks again so much, you guys have created the best show for me since the X Files!!! This blog is just fantastic. It amazes me that you devote so much time to explaining the creative process for the fans! I absolutely love the insight. This is certainly one of my favorite must-read blogs! I noticed in this episode that some of the scenes seemed to have a prominent lighting color (like one of the rooftops scenes was mostly green if I remember correctly). How do you decide what color to use? Is it based on the emotions of the scene, or the characters? I couldn't wait to read your blog to find out how you created that "weird" effect during the Sylar/Dale scenes. It created just the right amount of menace and foreboding. I think you're being too hard on yourself about the shootout scene. It was funny, but it didn't go too far. As a viewer, I could appreciate the danger that Hiro and Ando were in, so it didn't seem out of place when the gun was suddenly turned on them. This was the best episode of the season, and I can't wait for next week. Some of the shots I feel was weird though, but it's more because of editing and not really the shot itself. (About continuity and how the scene flows). Pleaaassse tell us that Chris is coming back, sometime. He's been a joy to watch. His scenes with Mil have been wonderful...but I'd love to see Claude interact with HRG! And I just thought the welder scenes were fuzzy because it's a friken cold bright day in Bozeman. It shows that I don't understand how sea-level people think--I thought the shot worked. The Heroes-fan community here in Finland(!) seem to think so too. Great action scenes, stellar "darkness" with Peter's character as he's talking with Isaac (i thought he would kill him Sylar-style, and that it would have resulted in Isaac's death we saw in ep.2 -- there was the gun and all...), and Claire's scenes have always been one of my favorites. Full of power and feeling. For me the shoot-out scene worked because it was about our "heroes" and not about the actual shoot out. The shoot-out was more of a setting than the actual focus of the scene. It worked. It always amuses me how many different ways and with how many different kinds of equipment a single scene can be shot. Even though I'm usually too excited for a new episode to pay much attention to the opening credits, I could tell this was one of yours. Very interesting and entertaining. As for the Hope/Gustavson shoot-out, sometimes it's funnier to leave things to the imagination than to show exactly what's going on. I'm not sure if that's what you meant when talking about whether or not to show the actual fight or not, but in the end, the story isn't about anyone other than Hiro and Ando so keeping focus on them makes sense. I liked their reaction to that unusually large explosion. There's also a question swimming around my brain about whether Hiro can compartmentalize his power b/c Ando remembered being shot at and asked what happened. Also, he didn't really reverse all time as the bullet wouldn't have gone back into the gun with force enough to throw her arm aside. She would have just walked backwards out of view again, no? Yes, this is what a fangirl does with her time—thinks about the minutae until her head goes asplodey. Hello and thanks from a big fan! I enjoy learning some of the craft behind the scenes as well as watching the show, your blog is great! Kudos for you and all you work with on creating what really looks fantastic pretty much all the time! I think you're being too hard on yourself on the shootout scene, everyone is their own worse critic, right? I found it great to watch those two giants battle it out A-Team style, and it added to the comedy a lot of fans expect when Hiro and Ando are on screen together. Now if we ever see Matt or Hana running through open space shooting from the hip you can be sure to hear about it but I think you're doing a great job creating the proper scenes for all the characters, really. Keep up the enthusiasm and great work, we'll keep watching and reading! Thanks for this blog...it's amazing! And, I caught you on the NBC Rewind commentary of this episode...but, the first act just keeps replaying through the whole episode. That happened last week. Just wanted to give someone a heads up! I LOVED the Hir/Ando/Gun fight scene at the end of the episode. I felt a real sense of danger during the whole shoot out. It was very "real" to me. And i LOVE the drama that takes place in the Claire storyline. Hi, Greg! 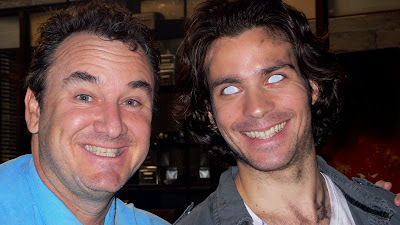 I just wanted you to know that there is a blog posted by a Spanish director, Alex de la Iglesia (El crímen Ferpecto, La comunidad, 800 Balas, El día de la Bestia) Now he is shooting "Oxford Murders" in London starring Elijah Wood and John Hurt. You should see the blog although most of it is in Spanish but at least you will enjoy the pictures as much as I enjoyed yours. Congrats on Heroes. I am getting to know about it. I thought the final scene was just beautifully shot and I'm hoping we see a lot of fallout, because this is absolutely huge for both Peter and Isaac. I loved the gunfight going on "behind" and practically off-camera from Hiro and Ando. I thought it really expressed their displacement in events going on around them. The comedy was well-played too. Great scripting. Hello MR.Beeman. Greetings from two Spanish fans! Now it’s a week since a wonderful day: last Thursday “Heroes” arrived to Spain. So we have decided to write you. First of all, we have to tell you that the pilot made an incredible share. The channel that aired it, grew from a share of a three percent (Thu, February 8th, 22:00 to 23:00), to a twelve percent!!!!!! (Thu, February 15th, 22:00 to 23:00). Thank God Internet exists, cause we’re super fans and we really like reading your blog, especially things about making off, directors and actors. And, thanks to Internet, we can follow the series at the same time US viewers do. It is incredible how each character is likable in one or another way (Sylar is one of the most magnetic villains that has ever existed- Magneto aside). We can’t wait to buy the DVD with the extras and commentaries!! We both are cinema students, and hope work in that, but... really, Heroes is cinema, and good cinema. We are astonished by the quality of the TV shows you have in US. Ok, more seriously... thank you again for the show, for your blog, for all the cast and crew’s excellent work. If you want, we will keep you informed about the Spanish airing’s share. 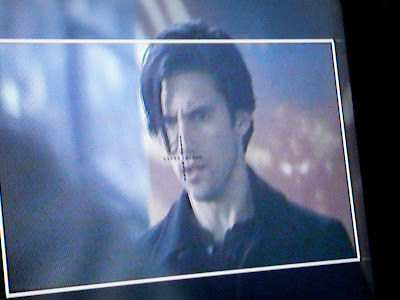 Oh, one last thing... we are so shoked by what happened to Simone in the last episode... was who we saw a Darth Petrelli? Will it last for long? We need to know what is going to happen!!!! More, we want more episodeeees!!!! P.S. : Sorry for our English, but we’re learning much thanks to Heroes. I agree with everyone that this is an incredible blog, in which you can learn about the show and they way it is produced. I hope this is also a space where fans can post their comments and those will be read by the "powers that be". Mr. Beeman: If you ro someone from your crew has the time to read other posts in 9th wornder's website, please read this one: (I can assure you'll find it amusing and revealing). I thought the gunfight scene really played into the comment Hiro made in his "goodbye" scene with Ando. The shootout was comic-book-like -- the bam/pop/boom of comic books, crazy explosions that didn't seem to fit with reality, etc. And yet, for all the apparent fakery, it almost got Hiro/Ando killed. When Hiro turns to Ando and says "life isn't a comic book," you realize that he's finally "got it" -- even when life (or shootout scenes) seems unreal and the bizarre becomes normal, there's still real pain, death, and trouble in the world. Thus, the shootout itself the perfect matchup of Hiro's former vision of reality and his new perspective. Not sure if that's what you were going for, but that's what I got out of it! Thanks a ton for your insightful and detailed comments each week. this was a terrific episode and your visual choices were spot on. i especially like the "swing and tilt" lens, it really made the two scenes with sylar quietly unsettling. your enthusiasm for your craft on this blog, and the commentary for that matter["Flat space!" :)), are great to read. thanks for allowing us fans this inside look! Thanks once again for a great episode! I LOVED the fire fight and seeing most of it from Hiro and Ando's POV. Strangely enough, while watching that Ando/Hiro/gunfight scene, I had a flashback to the old Star Wars scenes with the two droids walking through the Stormtrooper/Rebel shootout and not getting a scratch on their shiny finish. It worked for me as a balance between the tension of the dangerous moment and the lightness of two sympathetic everymen who are just struggling to follow their path. The only real visual problem I had through the entire episode is that it felt like we zoomed in on Dale's corpse one too many times. I couldn't help but feel a sense of "yes, we got it, moving on." All in all, it was an exceptionally well-done episode. But don't let all our praise let you get lazy. We're loving the show, and those of us who tuned in from the beginning or who showed up to the party late just hope it keeps up with the bar you've helped set. One of my favorite episodes so far and the ending left me chomping at the bit for more. My wife had to miss the episode and asked me to explain it. I told her there was no way, you have to watch the tape. Personally, I felt the Hiro/Ando gunfight scene worked really well. Focusing on them hiding reinforced the comedic framework of Hiro's scenes. Like a lot of the others, I enjoyed watching the gunfight scene through Hiro and Ando rather than actually watching the fight, which we've seen a thousand times before. Whether or not you did what Jeph wanted, I thought it was successful. The flying scene I thought was a homage to Chris Reeve/Richard Donner. You didn't mention that, though, so I guess not. Hi, Greg. There's a bit of confusion as to whether Peter invoked Hiro's power to slow/stop time when The Haitian shot him with the taser. Since you directed this one, would you be willing to say whether this is the case or not? It'd be very appreciated. Another fun, involving episode. Thanks for the blog post as well. I know there are dozens of people with powers (PWPs, if you will) who we haven't met, but I was disappointed with the Hana character suddenly appearing to Ted and giving him key info to move with. I'm not against new characters. Her entry's convenience to the plot was a turn-off. Fortunately, irksome moments where the plot drives the characters instead of the other way around are very few. Keep up the great work! I was actually surprised by the quality of Peter's flight scene, considering that this is network TV. I loved how he has speed bursts while flying (nice throwback to Nathan's sonic boom moment). It's a unique way to show flying and it looks great! Although I totally expect that Dale would die, I'm a little bit disappointed that the writers didn't come up with a little bit of struggle showcasing her superhearing ability to try to stop/anticipate Sylar from killing her. One thing viewers would want to see is how the heroes matchup their abilities to another. But all in all, I love Heroes! Keep up the good work! I personally loved the episode and thought it was one of the best in the season. I have thought that some of the last few episodes left me wanting more from them. Not in a OMG i can't wait for the next ep but in a they really could have done more in this one way. Unexpected was awesome all the way around! I just have one minor issue with it and i didn't even think of it during the ep it was after while reading the comments left in this blog. Milo/Peter was not only able to stop time and cause the prongs to drop but then he flew off the building. My issue is that this was done with the Haitian standing right there, infact he shot one of the stun guns. How was Milo/Peter the only one in the show that can use his abilities infront of the Haitian? Maybe this was explained and i went to the bathroom or something but i'd like to know. Trust me, if the answer was "whoops" i'd still watch every Monday! One of the best shows on TV. And STAN LEE!!! WOO!!! First George Takei, than Stan The Man himself!! Like, the god of comics. Masi gets to act with the coolest people. How about Bill Shatner next? It's all about the Star Trek. PS last anonymous person I think teh Hatian only negates other people's mind powers, such as Matt and Eden. I've just watched the preview clips for the next episode on the NBC site and it looks like one of the best so far! Again, THANK YOU for involving us, the fans, in your creative process and posting the backstage photos too. The reason this show works so well is the attention to detail and careful direction that you and the rest of the cast and crew work so hard at, and of course Tim's ability (power? haha) to keep this whole series grounded in reality so that it's truly a believable world. 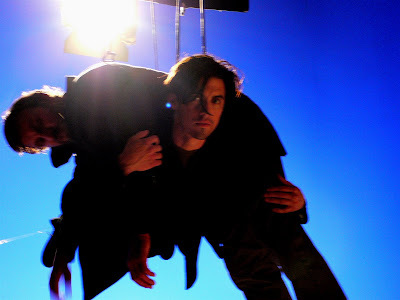 A PARTICIPATION OF THE TOM WELLING AS CLARK CANT ON HEROES END (CORSE) A PARTICIPATION OF THE HEROES ON SMALLVILLE TOO. ..."and I didn’t have the tech support I needed to get the blog online. (i.e. I have a very limited knowledge of computers..."
I hear ya! *lol* I'm a photographer first and computer geek last! I've been on Blogger for over a year and am still trying to figure out how everything works. Anyway...thanks for an excellent TV show. The cinematography, the actors/characters, storyline, all are top notch. Plus it's an added bonus to be able to watch Christopher Eccleston on American TV!! Yet another amazing look into the life of a wicked crazy TV show. Wow, what an insight. 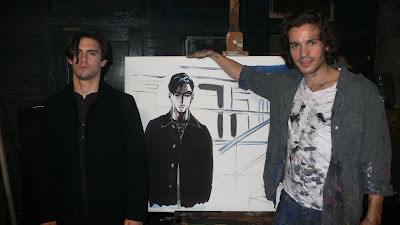 And hey, IMHO, Hiro and Ando worked. If you knew the kind of analysis the bullet scene has provoked over at SuperHiro.org, you'd think we were all nuts. The thing is, I don't think you CAN be inappropriately or overly comedic with Hiro - his character is so innocent and wondrous that he can't fail to make a beautiful contrast with the darker scenes. I don't claim to have a technical understanding of the lenses or shots use, but it worked for me, and funny moments from other characters were not missed! Swing & tilt! Sing it with me - swing & tilt! 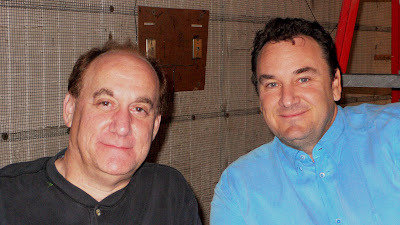 You're fantastic, Beeman, and the show is a sensational success. Congratulations, and tell everyone in the production that they have done an amazing job and changed the television landscape for the better. Thank you so much! ok, u r great!! I loved last episode, th eone with you and Ted(don't know real name) and Hayden and HRG, and evryone else. The show rocks, no matter who writes it! Any chance you could inform us of the name of the song (or the artist) that was playing on the iPod when we found Dale had been murdered? thanks for your words greg. as a fellow artist in the biz, i so relate to the journey you describe. as much as certain scenes turn out magically, there are others we wish we could spend a whole day perfecting. but somehow, we have to allow ourselves to move on to the next shot. your episodes are beautifully executed. i hope to work with you someday. Then they put wow gold cheap Snow-white in a box Cheapest Wow Gold made of glass. They took the glass box to a hill Wow Goldand put it there, and said, "Everyone who goes tbcgold by will see how beautiful she was." Then each mmorpgvip Little Man put one white flower on the box, and wow gold for sale they went away. prada sunglasses， Chanel Sunglasses , Coach Sunglasses .